The Club of Exporters held discussions with the participation of representatives of companies that will take part in the China International Import Expo and international wine exhibition ProWine China in Shanghai. The Economy Ministry reported that Zohrab Gadirov, Executive Director of Exporters Club touched upon the significance of work carried out in foreign countries in order to promote the “Made in Azerbaijan” brand. 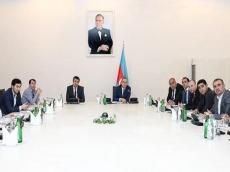 In addition, he gave information about exhibitions and other events held in foreign countries in order to increase exports of local products, further saying that products made in Azerbaijan are in great demand in foreign markets, and in particular in China. Earlier, Azerbaijani Economy Minister Shahin Mustafayev met with Chinese Ambassador to Azerbaijan Wei Jinghua. The minister underlined that Azerbaijan plans to open its next trade and wine houses in Shanghai, adding that it will contribute not only to the expansion of trade and economic relations between the two countries, but also to the recognition of Azerbaijani products in China and cooperation in the sphere of culture and tourism. Azerbaijan has its Trade House in the Chinese city of Liuzhou and a wine house in Urumqi. China International Import Expo will be held on November 5-10 at the National Convention & Exhibition Center in Shanghai, China. The event will gather government officials, business communities, exhibitors and professional purchasers across the world and provide them with new channels for countries and regions to do business, strengthen cooperation and promote common prosperity of the world economy and trade. ProWine China, China’s leading international trade fair for wines, will be held on November 13-15. It creates a platform both for international dealers and producers and for local suppliers to present themselves, establish contacts and get to know the Chinese market.